It’s no accident that the digital economy was the single bright spot during the Great Recession. Despite the downturn, the technology industry responded on an unprecedented scale. AT&T alone spent $140 billion between 2009 and 2014 to build advanced wireline and mobile networks—more in the U.S. than any public company. These networks became innovation platforms for Silicon Valley and numerous entrepreneurs. As a result, whole industries were transformed and new ones created. AT&T pioneered the all-in-one entertainment and communications package with U-Verse; and the company’s acquisition of DirecTV takes it one step closer to becoming the digital-entertainment hub for the home. 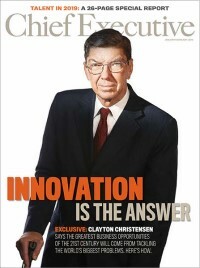 Under Stephenson, the emphasis has been on adapting to the marketplace, where the keywords are ‘instantaneous connectivity’, ‘virtualization’ and ‘cloud computing’. This push extends to employees, who are encouraged to take skills-improvement classes on their own time or risk on-the-job obsolescence. As early as 2012, Stephenson realized that to be a premier integrated-communications company, its workforce of 280,000 had to improve its skills. Vision 2020, Stephenson’s signature program, combines classroom-based and online classes in areas like data science and digital networking to elevate people’s technology skills. The man behind this transformation is a tall, soft-spoken former accountant born in Moore, Oklahoma whose father ran a cattle-feed business. Thirty-four years ago, Randall, then 22, and his brother Kevin, then 23, took jobs at a local Southwestern Bell office after figuring that the cattle-feed business wasn’t for them. Kevin worked as a lineman fixing the traditional copper lines that still connect landline telephones in most homes. Randall worked his way up the ranks, eventually becoming CFO under Ed Whitacre, the larger-than-life CEO who ran Southwestern Bell, which became SBC Communications and took over the old AT&T in an acquisition in 2005. Two years later, Stephenson succeeded Whitacre at the helm of the new company that took the AT&T name. Stephenson’s father and Ed Whitacre were major influences on his life, particularly when it came to managing risk. “My dad told me once that you will never have a lot of success until you’ve had a lot of failure because until you’ve had a big failure you’ll be afraid of it,” he says. Whitacre, who would later serve 10 months as chairman and CEO of GM after it emerged from bankruptcy, told Stephenson that “when you have a very large company, you have to do significant things to move the needle and significant things in terms of the kind of people you hire.” “He encouraged me to take risks on people,” the AT&T chief recounts. It’s safe to say that the AT&T of today barely resembles the Ma Bell of yesterday. The $147 billion Dallas-based company has invested aggressively in mobile, fast and secure connectivity to 355 million people in the U.S. and Mexico—a seamless cross-border network that’s unique in the marketplace. This includes high-speed fiber connections to more than 1 billion U.S. locations, as well as global IP network services that connect businesses on six continents representing 3.5 million businesses or 99% of the world’s economy. In addition, AT&T has invested $1.3 billion in a high-quality wireless spectrum to get a jump on demand for mobile Internet services—particularly video entertainment, thanks in part to its 2014 acquisition of Cricket and a $18.2 billion acquisition of a near-nationwide block of high-quality spectrum in a 2015 government auction. Switching to a software-defined network (SDN) by replacing hardware with software is enabling AT&T to move more data at a lower cost-per-bit. The goal is to have the lowest cost structure in the industry—in effect beating Moore’s Law in network performance. As he relates in the following interview, Stephenson is a big believer in the IoT where sensors—in everything from cargo containers and jet engines to machines on a factory floor—are connected. By the end of 2015, AT&T had more than 26 million connected devices and had certified more than 2,200 different types of connected devices on its network. Stephenson admits to one disappointment: the government frustrating AT&T’s bid to acquire T-Mobile from Deutsch Telekom in 2011 without technically blocking it. “We ended up replacing the spectrum we would have gotten through a different route so we landed in a good place,” he says. Soon afterward, the wireless industry split into two directions, with AT&T pushing the envelope with new offerings and a spectrum-rich portfolio.